After six months of profiling, researching and voting, we are delighted to announce the winner of the 2018 Mobile Person of the Year – Marc Allera, CEO of EE and BT Consumer. During the past 12 months, Marc’s remit has been expanded to cover not just EE but also overseeing BT Consumer. Both divisions have enjoyed successful years, with EE maintaining its position as the UK’s largest mobile network, both in terms of coverage and number of subscribers, and are bright spots for the wider BT Group. "It feels great and this all is testament all of the hard work that your team puts in every single hour every single day trying to build an even bigger and even better company, give better service to our customers, roll out more coverage, faster speeds in more places than ever before and that's what we're all about," Allera told TechRadar Pro. "We're a great team and to win this award is a testament to the hard work of many thousands of people who work so hard and I'm really proud of every single one of them." When you already top the lists, it can be tempting to rest on your laurels, but Marc has overseen the expansion of the EE network with a focus on landmass coverage, new retail and customer service initiatives, and is helping BT and EE establish themselves as leaders in convergence with new products launched last month. The 2018 Mobile Power 50 is the definitive list of the most influential figures in the UK mobile industry during the past year. The list has been compiled after in-depth interviews with key senior figures across the industry, from operators and retailers, to manufacturers and distributors. 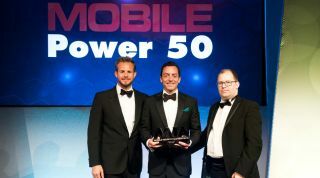 For anymore information on our Mobile Power 50, or to get more involved in the Mobile Industry Awards please contact mark.fernor@futurenet.com.